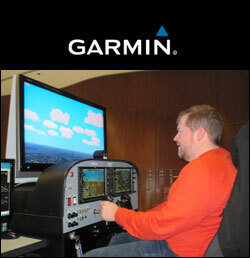 Did you know that the Garmin Store in Chicago will offer pilots an hour of instruction on the G1000 with a Certified Flight Instructor for free? When Rod Rakic, of MyTransponder, shared this with me I thought he had spent too much time above 10,000 feet without oxygen. Surely he knows nothing in aviation comes free, especially training. I am happy to report he was spot on. Garmin offers a GPS Academy from which you can select a variety of training options for their GPS devices, most of which require a purchase. However, that is not the case with the G1000 Mentor Simulator Tutorial which is a free course to FAA Certified pilots and student pilots. The course is an hour long one-on-one session in the FRASCA Mentor Simulator featuring the G1000 glass cockpit suite. Hayley, the Garmin CFI, walked me through the PFD and MFD and we discussed the core functionality of the system which I felt I already had a good handle on. Next, I put in a flightplan for a departure from Midway to South Bend, Indiana. I wanted to get more familiar with the auto pilot functionality and some of the more hidden features like drawing extended runway lines. Learning the G1000 in actual flight can be daunting. You need to be careful not to get fixated on the G1000, forgetting to keep your head outside the cockpit and flying the plane. Learning on the Garmin store simulator is more efficient. I was able to focus on the G1000 and learning the flows required to successfully use the device with less concern for the plane and no hobbes meter lightening my wallet. If you are planning to transition to an airplane with a G1000 cockpit and don't have access to the Garmin store, I highly recommend these G1000 Training tools. All of which provide great detailed information on the G1000. Though, in my mind you can't beat flying a simulator in real life conditions with a CFI sitting by your side for free. Next time you are in Chicago I highly recommend you schedule some time with the Garmin CFI, simply click on GPS Academy on the Garmin Store website to get started. While you are there enjoy the rest of their drool-worthy gadgets in their Michigan Avenue store. The President of the United States returned to our shared hometown of Chicago for the Memorial Day Weekend. 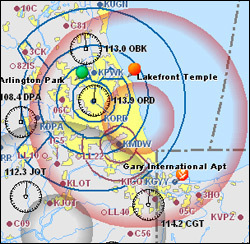 As a result a series of Very Important Person Temporary Flight Restrictions (VIP TFR) were put into effect for the airspace around the Chicago area. Historically, a visit from the President and the resulting restrictions were enough reason to keep me on the ground. I had heard of too many horror stories of pilots having their licenses suspended or revoked for infringing on the restricted airspace. My home airport, Chicago Executive (KPWK), was outside the ten-mile no fly zone that surrounded the President's Chicago home. However, it was located within the 30 mile radius of the Temporary Flight Restriction. After being taunted by a weather forecast calling for a long weekend filled with clear and sunny days on the forecast I decided this would be a great opportunity to learn how to live with the TFRs and enjoy a new flying learning experience. I scheduled the Windy City Flyers G1000 enabled Cessna and a flight instructor for Saturday afternoon. We spent some time on the ground before the flight talking about the TFR and the requirements for flying into and out of an area under a Temporary Flight Restriction. We were required to file an outbound flightplan and an inbound flightplan. Once submitted, we needed to obtain an use a discrete squawk code while in the restricted area. We also needed to be in two-way radio communications with ATC while flying in the area. Faster aircraft need to adhere to a 180 knots or less airspeed, something we were not concerned with in our Cessna. Be sure to look at the AOPA TFR Map before every flight or ask your pre-flight briefer about NOTAMs and TFRs. After obtaining our squawk code from ground control we took off from Chicago Executive Airport. The tower directed us over to Chicago Approach shortly after liftoff with whom we keep two-way communication with until we had cleared the TFR airspace. Once a safe distance from the restricted airspace we closed our flightplan. I was surprised that several planes were flying so close to the border of the TFR. A slight miscalculation by those pilots would likely result in a minimum of a 30 - 90 day suspension of their license. I spent the next hour under the hood in simulated instrument conditions working on basic flight maneuvers including straight & level flight, straight climbs and descents, standard rate turns and a combination of climbs, descents and turns. On the way back to Chicago we opened our return flightplan, obtained a new discrete squawk code and talked with ATC all the way back to Chicago Executive. I stayed under the hood until we were on a mile and a half final for runway 16 where I completed the flight with a nice smooth landing. The 0.8 hours of simulated instrument time was my first in just under six years. I enjoyed both learning how to operate within a TFR and also logging some instrument time. I am looking forward to continuing to train for my instrument training as time allows. This past weekend I had an wonderful opportunity to fly over and through the Rocky Mountain Region west of Denver. Since all of my flight time to date has been over the relatively safe landscape of the Midwest I contacted some local experts at the Aspen Flying Club to give me an overview on Mountain Flying. On Saturday I met Matt Beckman who would be my CFI for this flight experience. Matt has been flying since he was nine years old and grew up flying in the mountains so I knew I would be able to learn a lot from him. We spent more time than usual doing a preflight briefing, discussing some important points for the upcoming flight including density altitude, handling mountain winds, crossing over mountain ridges, emergency maneuvers, radio communications in the mountains and the effects of hypoxia. Many of these topics were well covered in the online courses and articles I had reviewed prior to the flight, but talking to Matt helped me ensure I understood each topic clearly. 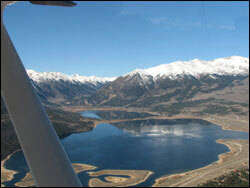 We filled our flight plan then fired up the G1000 Cessna 172 and took off for an amazing flight over the Rocky Mountains. Flying in the Midwest, there is almost always a safe place to set the plane down if you encounter an engine failure. Fifteen minutes into this flight we crossed over our first mountain ridge and finding suitable places to land started to become a serious challenge. During our flight we were continuously looking for and calling out our next suitable place to land should an emergency arise. Often the G1000 flat panels are blamed for keeping pilots' eyes inside the cockpit looking at the pretty monitors. That was definitely not the case on this flight where the mountains provided a majestic backdrop that was hard to keep your eyes off of. The altitude in Denver is 5280 (also the name of their beautifully designed city magazine) after departing Centennial we needed to stay underneath the Denver International Airport airspace for the first few miles before then climbing up to 10,500 feet to clear the Tarryall & Kenosha mountains of Pike National Forest that ranged in height from 8,000 to 11,000 feet. After clearing the first ridge we flew over a valley enroute to Buena Vista and Central Colorado Regional Airport (KAEJ). We made two landings here including one in which we simulated a short field landing. From there we departed northward up a valley that would lead us to Leadville, CO home of North America's highest airport, Lake County Airport (KLXV), with an altitude of 9,927. It is strange to look at your altimeter and see 10,900 as you are entering downwind for landing. Even odder for Midwest pilot was the sluggish climb we made out of Leadville as the plane labored to produce lift as we rolled down the runway at nearly 10,000 feet above sea level. The FAA requires that all pilots flying aircraft above 12,500 feet for more than 30 minutes must use supplemental oxygen. This is to prevent the effects of hypoxia. However to climb over many of the mountains in the area we needed to climb above 12,500 to 13,500 feet. We watched the clock to ensure we were not above the 12.5K mark for more than thirty minutes. Even at 13,500 feet there were a few mountain peaks that were higher than we were flying which was an amazing sight. After crossing over a large mountain range we descended back down under 10,000 feet so we could practice a simulated emergency turn to avoid a terrain collision. 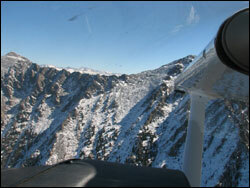 I pointed the plane at a mountain and as we approached I pitched back to climb. On this cooler day we likely could have climbed over the mountain but for practice initiated the turn. I pulled power and set the flaps to full then turned at a 30° bank and let the nose roll over a bit allowing the plane to make a tight 180° turn banking us away from the danger. After that we turned East and headed out of the mountains and back to the safety of flatland below. Although the plane descended, my spirits remained sky high from this amazing experience. I would strongly encourage any pilot to enjoy applying their flying skills to this challenging and beautiful area. If you are in the Denver area reach out the folks at The Aspen Flying Club and tell them I sent you. The video below was shot with a cockpit mounted video camera and a hand held camera. In addition to the video I shot some photos which can be seen on Flickr. 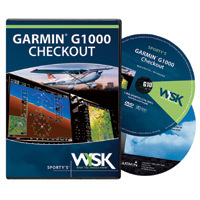 Sporty's recently released Garmin G1000 Checkout ($89.95) a 2-Disc set dedicated to helping pilots transition from flying traditional steam gauges to flying the Garmin based Glass Cockpit. Having recently reviewed four other G1000 products I was interested to see how this latest entry into the G1000 training market would fare. Included in the package is a DVD training video and a copy of the PC Software Simulator. The DVD is hosted by Airshow Announcer and frequent Sporty's Training DVD host Rob Reider. If you have used other Sporty's DVD products this course will feel familiar right from the start. I preferred this product over the previously reviewed Sporty's Air Facts: Flying Glass Cockpits which split its time between the G1000 and the Avidyne FlightMax Entegra. The Garmin G1000 Checkout provided some great scenario-based training as you fly along on two VFR flights and one IFR cross-country flight. I enjoyed that this product came bundled with the PC Software Simulator. As expected after watching the video I wanted to jump in the cockpit but I did the next best thing and used the G1000 Simulator to try some of the steps shown in the video. Repetition is one key to learning and retaining lessons and tips learned from the DVD. I strongly recommend this product as it is a great resource for pilots planning to fly the glass cockpit. However, the one shortfall of all DVDs is they are limited in what they can cover, and follow a pre-determined path. I suggest complimenting this DVD training course with Max Trescott's G1000 Glass Cockpit Handbook which will give you an in-depth resource that will help you to continue to learn while also leveraging your new G1000 simulator. There is still some debate as to whether or not glass cockpits make flying safer. Either way, they sure are fun to fly. So use these DVDs to learn how to enhance your flying experience. This weekend I had my first opportunity to confront one of the leading killer of pilots, Get-There-itis. The Aircraft Owners and Pilots Association say "The determination to reach a destination, combined with hazardous weather, claims the lives of dozens of pilots and their passengers yearly." For weeks I have been planning a cross-country flight to Indianapolis. The plan was for my Dad and I to fly from Chicago to Indy to visit my Grandmother (my Dad's mother) and also enjoy the first day of time trials for the Indy 500 at the Indianapolis Motor Speedway. As the flight date drew closer, the weather in the 10 day forecast continued to improve, only to disappoint the day prior to the trip. The night before our Saturday morning departure the forecast called for rain, low ceilings and high winds. When I awoke, I was encouraged by the look outside but that did not last long. A combination of online weather through AOPA's website and a call to Flight Service for a weather briefing proved that it would not be a great day for the flight. At my destination there was a direct crosswind of 18 knots, gusting to 25 with forecast for no change in winds. Additionally, at airports near Chicago there were deteriorating ceilings and reports of turbulence and wind shear. I made the executive decision to scrub the flight. Luckily the weather looked like it would improve overnight. So I adjusted plans for a Sunday roundtrip. I woke up Sunday morning to a nearly windless blue sky. I picked up my Dad and we headed out to Chicago Executive. and before too long we were airborne and flying along the Chicago skyline enroute to Indianapolis. It was a quiet morning in the skies so we had no trouble getting flight following from Chicago Approach and throughout the flight. I enjoyed showing my Dad the the intricacies of the G1000. Having been raised in Indiana he seemed to enjoy viewing towns from above that previously he had only been accustomed to seeing from the ground level. 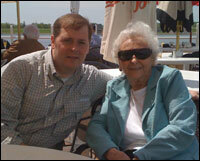 After arriving at Eagle Creek Airpark we drove out to visit with my Grandmother. We decided to go back towards the airport for a Mother's Day brunch. We ate at Rick's Boatyard a favorite destination for pilots. I had to sample the Boatyard burger since it was rated in the Top 10 $100 Hamburgers of 2009 earlier this year. The burger lived up to its rating. Even better was the company. It was great sharing the flight with my Dad then enjoying a Mother's Day brunch with my Grandmother (one of my loyal readers, Thanks Grandma) and my Dad. After the enjoyable meal I re-checked the weather. According to the briefer it looked like we would have lower ceilings but fine VFR flying weather, so we fired up the trusty Cessna and rolled down the runway for departure. Again we were able to pick-up flight following, though as we approached Chicago the controllers were getting busier and busier and finally canceled our flight following. We also noticed visibility diminishing a bit as we approached Lake Michigan and a light rain started to fall on the windshield. As we passed Gary, IN the rain increased and it became apparent that there was a storm ahead in the Chicago area. Although we were anxious to get home to enjoy a Mother's Day dinner with my mother I knew the right call was to divert. During flight training instructors often have their students practice unexpected diversions. A pilot on my shoulder reminded me of all the horror stories about pilots flying into instrument meteorological conditions(IMC). Since earning my license I have not had a real reason to divert but found the decision came easy. I always figured I would not be one of those pigheaded pilots who suffer from Get-There-Itis, and was glad to see I could resist that urge! I called up Gary and re-routed for landing at Gary International. My Dad and I sat back in the leather chairs at the Gary JetCenter and watched part of the Cubs game while I periodically checked in on the patchy storms working their way through Chicago. After about a forty-five minute break the weather had cleared and we were back on our way. The storm had cleared out the General Aviation traffic and we were able to pick-up flight following again for the bumpy return flight up the lakefront. Often people ask what I love about flying. I can say that this weekend's flights was one of the best reasons to fly. I was able to spend a great day with my Dad while surprising my Grandmother for Mother's Day and enjoying her company for the day. I look forward to making this flight again sometime soon. Weather permitting, of course. All of my 2009 flight experiences have been in the G1000 enabled Cessna 172SP. 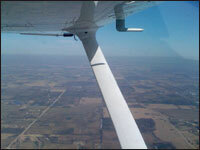 I took a few introductory flights with an instructor then most recently flew a short solo cross country to continue to build both confidence and proficiency in the Glass Cockpit. I have had the privilege of checking out several products that have been designed to help pilots transition into the glass cockpit and wanted to share my reviews with you. Garmin G1000 Cockpit Poster Sporty's offers a free Garmin G1000 Cockpit Poster with an order over $4.50. If you are already planning on placing an order with Sporty's add this to our shopping cart before checking out. I found it to be a valuable reference while trying to memorize the location of the G1000 knobs and keys. I kept it laid out on a table while referencing many of the materials listed below. I know several pilots that have transitioned into the glass cockpit and nearly all of them used and highly recommended Max Trescott's line of products. 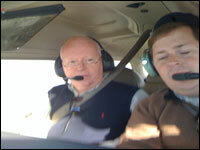 Max is a Master CFI and Master Ground Instructor that was named the 2008 National CFI of the Year. He did an excellent job of cataloging his knowledge on the G1000 in the Max Trescott's G1000 Glass Cockpit Handbook. I found it to be a quick and easy read that provided many valuable tips for getting the most out of the G1000. Many of the tips Max provided where either overlooked by my CFI in my introductory flights and things I am glad I learned before bad habits formed. I think the G1000 Glass Cockpit is a must own manual for G1000 pilots. Read it once then keep it on your bookshelf or in your flightbag for future reference. The book can be purchased on Max Trescott's website for $34.95. I also checked out the complimentary CD-Rom course that Max Trescott developed for G1000 pilots. Much of the content that is on the CD-Rom is duplicated from the book but presented with narration and interactive imagery. If you are on a limited training budget you might be able to get by with either the handbook or the CD-Rom. Choose which is most appropriate for the way you prefer to learn. Personally, I enjoy having both options in my arsenal. I liked that the The CD-Rom did a good job of showing all the softkeys and how they interact with the different screens of the PFD and MFD. As, I have not gone through Instrument training yet I have not checked out the IFR CD-Rom. Priced at $99.95 this is the most expensive of the products I checked out. The Sporty's Air Facts: Flying Glass Cockpits video download is another great resource for the G1000 bound pilot. The advantage of the video is it shows the G1000 in action, not through screen captures and still images but through live motion video. You can see how the G1000 is likely to appear when you are behind the yoke. I liked the portability that allowed me to bring this along via my iPhone for viewing at my convenience. The one downside to a video compared to a manual or CD-Rom is it is harder to jump to a specific spot for reference purposes. It is a great product for getting an overview and introduction to the G1000 and the Avidyne FlightMax Entegra. The video can be downloaded directly from Sporty's for $9.95. If you plan to fly the Glass Cockpit I highly recommend all of these great products. Safe flying! The mercury is on the rise in thermometers throughout the Midwest and pilots are finding their way back to the airport. I could not resist the call and reserved a plane for a weekend afternoon flight, my first in over a month. While enjoying the first jacketless pre-flight of the year I noticed all the empty spots on the tarmac and realized I was not the only one with the great idea of going flying. After engine start-up and taking down ATIS notes I had to be patient to wait for a break in all the radio chatter to make my initial call-up to Chicago Executive ground control. I informed them that after departing their airspace I would be interested in flight following for my flight to Waukesha (KUES). Sometimes getting flight following in the Chicago airspace can be hit or miss and I worried that I might not get flight following as I figured the controllers would be busy. I was right about them being busy but they were able to support my request. As I departed the Chicago Executive airspace I counted more than seven airplanes on the G1000 MFD. I felt confident I would have safe separation from the aircraft with the combination of my visual scan, the G1000 traffic advisories and updates from the air traffic controllers. The weather was ideal for flying with light and variable winds, unrestricted visibility and no sign of a ceiling in any direction. After a nice 40 minute flight I arrived at a busy Waukesha airport. There were several planes performing their pre-flight run-up and three planes in addition to mine that were communicating to the tour while heading inbound for landings. I made a nice smooth landing and taxied to the terminal for a short break. When I was ready to depart for the return leg I had the airwaves and airport to myself. On the return flight I again requested and received flight following. At one point the controller pointed out traffic to my two o'clock position eastbound and also a plane at eleven o'clock northwestbound both at ~3,000 feet I watched from a few thousand feet above and a mile or so away as these two airplanes crossed paths much closer than I would have preferred as one of the pilots. I don't believe either was taking advantage of flight following services as I never heard the controller give either of them traffic advisories. I highly recommend pilots take advantage of flight following whenever they can on a VFR flight. When I trained my instructors never spent much time teaching me how to request flight following and how to use the service. I found this PDF to be a valuable resource for detailing how flight following works. I enjoyed adding another new airport to my list of airports visited while also building more time and experience in the G1000 enabled Cessna 172SP. I will be publishing a few posts in the coming week outlining some of the tools I have used in the past few weeks to continue to learn all the great features of the G1000. On Saturday I went for my second familiarization flight in the G1000 enabled Cessna. On my first flight last week we spent most the time reviewing the basic functionality of the G1000 system. Saturday's focus was on how to handle failures and also how to use some of the advanced options such as flight planning and working with the autopilot. I planned a 120NM cross country flight from Chicago Executive to Rockford (KRFD), De Kalb (KDKB), Schaumburg (06C) and then back to Chicago Executive. After firing up the Cessna my CFI showed me how to enter the entire flightplan into the G1000. We used two GPS waypoints and each airport to set our course. It took only a few minutes to get the hang of it and get the entire flight entered into the system. My preflight briefing with Flight Service warned me of some light to moderate chop along the route and also some stiff winds. Sure enough as we climbed out of Chicago Executive we got tossed around a bit until we climbed above 2,500 feet at which point the ride became smoother. As I turned the plane west for Rockford we took on a direct 53 knot headwind slowing our forward progression to a measly 52 knots. I felt like I was back in my trusty Cessna 152 I used to train in. I did not mine the slow progression though as we had a beautiful view of the snow-covered farm lands below. It also allowed some time for me to learn how to use the autopilot feature. I was able to engage the autopilot to maintain our flightplan path and to maintain our altitude. It made for a very relaxing flight to Rockford. As we approached Rockford we learned we would be following in a Boeing 767 which was cool. I have on shared runways with the big tin when flying into Midway. After making a nice landing at Rockford we taxied around to depart on their westbound runway. We had a beautiful view as I lined the airplane up on the centerline the setting sun was directly in front of us. I regret now not snapping a photo before departing. It has been a long time since I have been airborne during a sunset and forgot what a wonderful way it is to enjoy the end of a day. From Rockford we headed southeast to De Kalb which allowed us to partially benefit from the strong winds from the West. It was after departing De Kalb that we started flying east and now enjoyed the 53 knots of wind as a tailwind. All of a sudden we were cruising along at a ground speed of just over 170 knots. As we approached Schaumburg it became apparent we were going to have an extremely strong direct crosswind so we decided not to make an landing. Instead we continued on to Chicago Executive for my first night landing in nearly two years. I forgot how your perspective changes at night and flared earlier than I should have and our landing was not nearly as smooth as I would have liked. Though, not even a less than stellar landing could dampen my mood. I love flying this 2 year old Cessna with the G1000. I am now signed off to fly it and look forward to enjoying flights in this plan in 2009! Mother Nature was kind enough to let me go flying this weekend. Although she kept the snow and high winds away, I did have a chilly 8° pre-flight experience. After a 15-minute pre-heat of the engine the plane was ready to fly. Yesterday's flight was a fun learning experience for me. It was only my second flight in a glass cockpit equipped airplane. With all the other Cessnas booked for the weekend I had the choice to see another weekend go by without flying or check out the 47TN and its G1000 Glass Cockpit. In order to better prepare for this flight I downloaded Sporty's Flying Glass Cockpit video. This helped me learn the ins and outs of the G1000 glass cockpit. I highly recommend the video to anyone looking to fly in a glass cockpit. On top of that video, when I arrived at the airport the CFI I was flying with sat me down and walked me through a computer-based demo of the G1000. The combination of the video and software tutorial made me feel much more comfortable in the G1000 cockpit. I can see how it is often said that the biggest problem with the G1000 is remembering to look outside the cockpit. The combination of great data, traffic advisories and weather information could be construed as information overload. But I think it provides information that can make your flying more precise and safe if used properly. One of my favorite features was the last call playback. After being advised by the Kenosha tower with instructions for entering the pattern and runway to use my instructor showed me that if I forgot or misunderstood the last call I could hit the playback button and hear it again. This is wonderful as it allows me to double check what I was cleared for without me having to clutter up the airways with a repeat of the call. I realize now that my FBO is acting like a drug dealer. Giving me just a taste of the G1000 knowing now I will not want to go back to my standard Cessna 172 with its antiquated steam gauges. This plane 47TN is only two years old and even offered seat belts that included air bags (I had no idea these even existed). This is a long way from the Cessna 152 I took on my introductory flight over five years ago that had more duct tape than seat fabric inside the cockpit. I plan on taking one more flight with a CFI next weekend so that I am checked out to fly the G1000 Cessna 172 whenever I want. On the next flight we will review the flight planning functionality the G1000 offers and also how to deal with screen failures or other emergency situations in relation to the G1000. I am hoping to log my first hours of flying in 2009 this weekend. The weather looks to be cold but clear enough for me to fit in a flight. The only plane that was available was the Windy City Flyers Cessna 172 that is equipped with the G1000 glass cockpit. I have only flown a glass cockpit equipped airplane once before when I had the chance to take a flight down the Hudson River to check-out the New York City skyline. After that flight I posted "After spending all of my flight time flying with traditional gauges I expected to be overwhelmed by the glass cockpit displays. But, I found them easy to read and relatively intuitive. I can see how it would take 10-20 hours to master the use of the system but after a little over an hour I was starting to understand where I needed to look to find the relevant information." That was nearly two years ago so I am sure that the glass cockpit will seem foreign to me again but I am looking forward to giving it another try. I will update you on my experience after the flight.